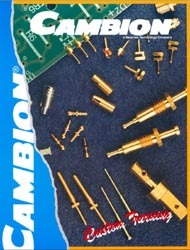 Established in Castleton, Derbyshire over fifty years ago, Cambion Electronics Ltd specialises in the high speed machining of non ferrous parts up to 10 mm diameter using Swiss Sliding headstock machines. Recently added CNC equipment provides the capability to machine ferrous materials up to 20mm diameter. Machinery includes: - Tornos - Tor 4, Tornos - R10, Tornos - M7, Escomatic - D 4, Escomatic - D6, Gibbs & Citizen CNC. Additionally Cambion can offer High Speed Stamping, Injection and Compression Moulding, Coil Winding and Light Assembly.